Miami Hurricane’s tight end David Njoku is a physical freak. 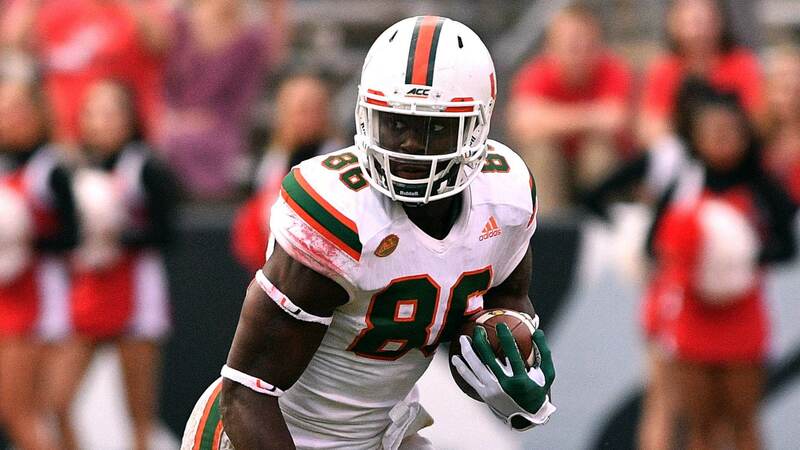 At 6’4″ 245 pounds, Njoku has the ideal size and bulk for an every down NFL tight end. With a 4.62 40 yard dash and a 133″ broad jump, Njoku has athleticism which only a small percentage of tight ends possess. Because of these measurables, raw talent, and his pure athletic ability, Njoku will most likely be selected in the first round of the 2017 NFL Draft. Let’s take a look at the tape to see if that selection is warranted. As mentioned, David Njoku is an impressive athletic specimen. With his arm length, frame, and other physical measurements, Njoku is a tough match-up for the defense to account for. A player who will prove too fast for linebackers and too big/powerful for defensive backs, Njoku will make a living as a receiving tight end at the next level. One area Njoku absolutely excelled in was with his ability to make plays after the catch. On multiple occasions Miami got Njoku the ball on quick screen plays, both inside and outside the numbers, and allowed him to do the rest. Against West Virginia here, we see Njoku catch a bubble screen from 23 yards out and take it to the house. He is a tough player to bring down in space due to his size and strength, and has the ability to go both over and through defenders who don’t properly break down or bring their hips through the tackle. Considering his size and pass catching ability, Njoku is an absolute problem in the red zone. Njoku shows the ability to both box out and go over smaller cornerbacks, muscling the ball away for touchdowns. He exhibits impressive body control on the sideline, and is cognizant of where he is on the field. Due to this balance and awareness, Njoku is able to tap his feet in bounds even with defenders trying their best to knock him out. On this play against Pitt, we see Njoku’s ability to control his body and win in the red zone. When given the chance, I also saw Njoku high point the ball in the end zone, something he will be asked to do a lot on fade routes at the next level. As a route runner, Njoku is still very raw. While I did see him get open vertically, and at times win with both out and in breaking routes, he is not as smooth a route runner as you’d expect for someone with his athletic ability. With some coaching up, however, I see him fixing this minor flaw in no time. As a blocker, Njoku sometimes struggles, albeit never for a lack of effort. Most of the time, I would classify him as “good enough” in run blocking, but he could still use some improvements on his technique. Here we see him get beat quickly off the ball, get knocked off balance and pushed into the backfield. He needs to keep his pad level down when run blocking, and do a better job of utilizing leverage and hand fighting against defensive linemen. While I don’t expect Njoku to be put against defensive ends one-on-one very often, he often does a solid job against outside linebackers and defensive backs in space. David Njoku is a versatile player, and the exact type of tight end teams are looking for in 2017. He shows the ability to line up both in-line and in the slot, and will be a match-up nightmare for NFL defenses his entire career. While much of his game is still raw, and he can use some coaching up, I have no reservations about giving David Njoku a first round grade in the 2017 NFL Draft.